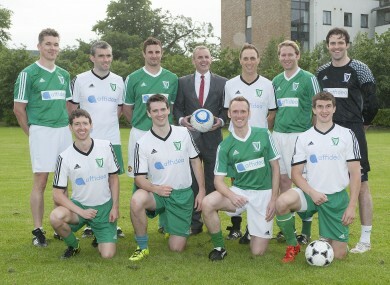 The team with Affidea's Tom Finn at last week's training session. THE IRISH TEAM kit for the World Medical Football Championship has been stolen from the boot of a player’s car, just days before the team of soccer-playing doctors is due to leave for Barcelona. The kit, which was worth €2,300 was stolen from the car last night on St Columba’s Road in Drumcondra and gardaí are investigating the theft. The team will be representing Ireland at the sporting championship, where they will face teams from countries like Britain, Venezuela, Canada, South Korea, Austria and Germany. In order to take part, players must produce their passports and even copies of their medical degrees before kick-off. The referee also holds a medical knowledge pop-quiz on the pitch before each match to make sure the players are qualified medical doctors. “It’s a real nightmare for the team that we are now left in a situation where we are heading off to this great tournament to represent Ireland and may not have appropriate kit for the occasion,” said Tommy Fitzgerald, a GP and member of the team. It was a real honour to be involved previously and a huge part of the honour was certainly standing proudly as a team in the Irish jersey and belting out Amhrán na bhFiann. We will go out there and represent Ireland with passion and energy even if we have to play in the white coats! The team sponsor this year is Affidea and CEO Tom Finn said that while he is appealing for the public to help gardaí with their investigation, his company will do everything in its power to ensure the team leaves Dublin airport in 13 days’ time with a full kit. Email “Team kit stolen from Irish doctors days before Medical World Cup”. Feedback on “Team kit stolen from Irish doctors days before Medical World Cup”.